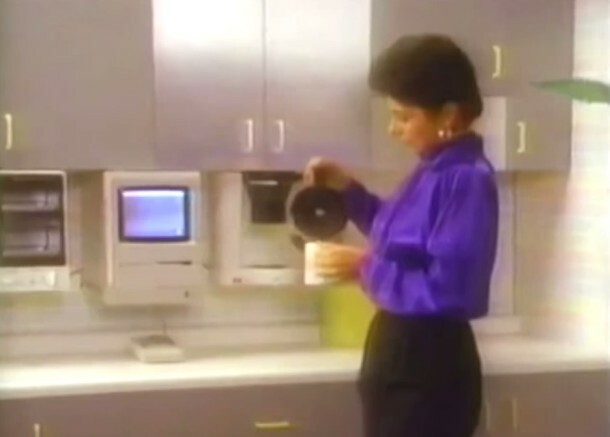 In 1987, Apple came out with a conceptual forecast video of sorts imagining what the then future year of1997 would be like, and how Apple and technology would permeate our lives. The (very retro) video outlines all sorts of amusing concepts, some of which came to fruition – like instant access to networked databases and virtual assistants running on computers, and many ideas which have not yet come to be – like projected holograms streaming out of a computer screen into a meeting, or an Apple satellite. You’ll find cameos from famous Apple employees John Sculley and Steve Woz make prominent appearances in the video, but Steve Jobs is nowhere to be seen as he was ousted from his company just two years prior to the release of the speculative clip. The video is pretty goofy all around, though since it’s intended to be serious, it really has nothing on this outrageously cheesy Flashdance video from 1984 Apple Corporate let alone the equally corny Apple Ghostbusters spoof from 1984. And no, we didn’t get a virtual assistant type of Mac talking to you with gathered news articles from the kitchen while making coffee in the morning, but instead we have Siri who is more than willing to do and tell you about all sorts of things from a huge command list. Heads up to Cult of Mac for finding this gem, enjoy! What if you had bought Apple stock instead of Apple hardware? The installed Mac Plus with that big Kensington trackball in the kitchen is kinda retro-cool, but definitely impractical in the typical kitchen with limited space.